Here we are, the middle of April and I’m sure a number of you are already frustrated with the Kansas City Royals. I mean, the bullpen has been a dumpster fire, the offense feels anemic and it’s just been a struggle to play games on consecutive days. Luckily, there is another way to enjoy Royals baseball this summer without watching the big league club. For those of us longtime fans, we spent a number of the ‘Lean Years’ paying attention to the Royals minor league teams and keeping track of what the top prospects were up to. It was a way to keep an eye on the future while figuring out if these players fit in to what Kansas City needed. So doing this can be daunting for a newcomer to Royals baseball or just for someone who has only ever focused on the major league squad. To help you out on this journey, I’m going to pass along some links and websites to keep track of so you can follow the progression of the Royals of tomorrow. Let’s start with the Royals AAA affiliate, the Omaha Storm Chasers. To keep tabs on the team you just need to go to their website where you will get daily updates, schedules, statistics and more. You can also follow them on twitter or instagram. Top prospects currently on the Storm Chasers roster include Hunter Dozier, Richard Lovelady and Trevor Oaks. Since Omaha is the Royals top rung of the minor league system, they are a good source of seeing players who could be on the main roster sooner rather than later. Going down the line, there is the Kansas City’s AA team, the Northwest Arkansas Naturals. You can check out their official site for daily updates and the regular updates on Twitter. The team right now houses prospects like Foster Griffin, Samir Duenez and Donnie Dewees. The Royals occasionally promote players from AA but not as often as they used to, as many will receive a little bit of time in AAA before their promotion to the big leagues. The Naturals are also the team that current Royals bullpen coach Vance Wilson was managing for the last couple of seasons. I mention Wilson, since I’ve long believed he is a future Royals manager in waiting, which is relevant since Ned Yost’s contract runs out at the end of the year. Sliding down to High A ball, where we check in on the Royals affiliate, the Wilmington Blue Rocks. You can check out their main page and follow them on Twitter. Their roster has a nice array of prospects like Gerson Garabito, Chase Vallot, and top prospect Khalil Lee. The team will probably see a plethora of other top prospects recalled to their squad this year, since a number of the team’s top talent is in the lower section of the farm system. Finally, there is the Royals Class A team, the Lexington Legends. Once again, they have their official minor league site and Twitter to follow. The team has a number of the Royals top shelf prospects, like last year’s number one draft pick Nick Pratto, MJ Melendez and Seuly Matias. The players at this level are names you should be keeping tabs on and watching their progress, as they could be a big part of the major league team’s future. While the Royals are ranked as having one of the worst farm systems in baseball, the players at this level could start to turn the tide and we could start seeing results from them as early as this year. If that isn’t enough to wet your appetite, there are a number of other sources of where you can get good analysis on players to keep an eye on. Clint Scoles does great work over at Baseball Prospectus Kansas City and you can follow him on the Twitter machine. There is also the Royals Farm Report, which does a thorough job of covering all aspects of the Royals farm system, whether on their site or on social media. I would also be remiss if I didn’t mention the great work that Minda Haas Kuhlmann does, especially covering the Storm Chasers. You might have noticed that she took a number of the photos you see in this article and writes a weekly feature over at Royals Review. The feature is called “This Week in the Minors” and is a good way to keep up to date with what is going on with the organization on a weekly basis. Minda is a great writer and I highly suggest you check out her work, as it is always top notch. Meanwhile, I will occasionally write about some of the up and comers here at bleedingroyalblue.com. One of the fun aspects of being a baseball fan is keeping track of the players who are on the way and I’ve always enjoyed writing about them on this blog. So that should get you started on following the Royals minor league system and help educate yourself about ‘who is next’. Just remember that while the major league team will probably struggle most of this 2018 season, they won’t lose forever. The odds always come around at some point and the Royals will be a contender again. When that happens, you will already have an idea who will be a part of the “Royal Resurgence”. We are not even ten games into the Kansas City Royals season and already the injury bug has befallen the team. Jesse Hahn was the first to end up on the disabled list, followed by Adalberto Mondesi, Bubba Starling, and Nate Karns. Salvador Perez ended up down for the count on Opening Day eve, and you can now add left fielder Alex Gordon to the list. Gordon has been like many in the Kansas City offense, as he has gotten off to a slow start in his seven games played. Gordon is hitting .174/.208/.217 so far with a blank slate on both home runs and RBI’s but there is a slight positive so far. Gordon has seen an increase in his hard hit rate, as it is currently sitting at 41.2%, compared to the 29.2% he posted last year. Now, this is the smallest of sample sizes, but there have already been a number of balls hit by Gordon that were right at someone, many times in a shift. While the injury doesn’t appear to be a severe one, it does make you question whether or not age is just catching up to him. Gordon is in his age 34 season and it has felt like he has been hit with one injury after another these last few seasons, one possible explanation to the regression that we have been witnessed to. 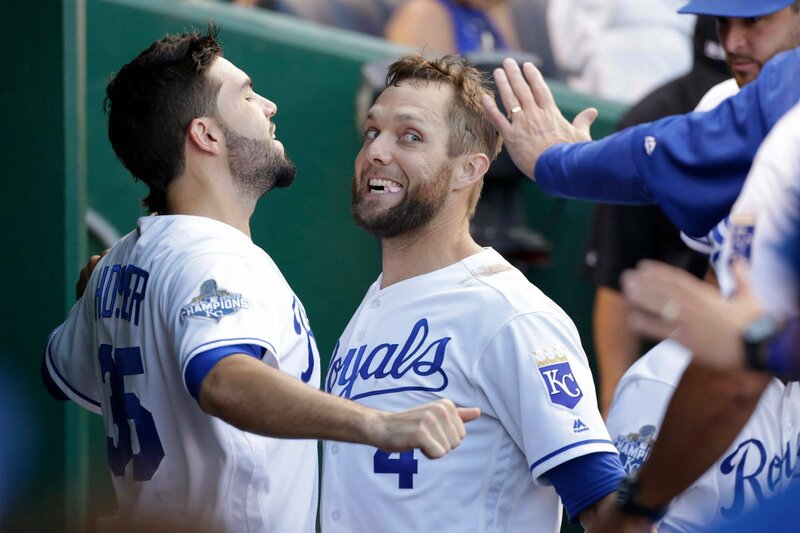 As more and more time goes on, it has felt like the Alex Gordon we love started fading in July of 2015 and by the time his contract ends he’ll be just a shell of his former self. I hope that isn’t the case, but age and injuries can be a lethal tandem for a player trying to return to past glory. Royals catcher Salvador Perez’s return seems closer to four weeks than six weeks. Can get into his squat with less tightness in that left knee. Perez has been using an aqua treadmill and an Alter G, which is basically an anti-gravity contraption, Ned said. The Royals have been getting by with Drew Butera and Cam Gallagher behind the dish, but neither provide the kind of offense that Perez racks up on a yearly basis. With the offense in a bit of a funk, the news of Perez’s return should be a boost to a team needing a kick in the pants. The reality is that the current Royals roster is just not equipped with the proper depth needed to sustain injuries to veterans like Gordon and Perez. In year’s past the team has had players ready to step up in for a ‘break glass in case of emergency’ situation. Gordon’s injury would have been the perfect time for Bubba Starling to get some major league playing time, but alas he is on the disabled list as well. Instead, the Royals are forced to give playing time to guys like Paulo Orlando and Abraham Almonte and hope the DL stays are kept to a minimum. If not, the season could drag on even worse than first expected. The ship isn’t out-and-out sinking, but it is starting to take on some water.